Can Invisible Braces Improve Your Smile? A revolutionary new app connects you (and your teeth) with board-certified orthodontists. Still searching for the secret to a superb smile? Invisalign paired with the all new SmileSesame app could be just what the dentist ordered. Invisalign is used to correct a vast array of different dental problems, including crooked and misaligned teeth, uneven spacing, crowding, overlapping, and even underbites and overbites. Invisalign has helped thousands of people smile with confidence. While those who have severe dental problems may not be eligible for this form of correction, these invisible braces are perfectly suited for individuals who require a mild to moderate degree of correction in order to look their best. Once treatment begins, the patient is provided with a new custom-designed invisible aligner every few weeks. Since each aligner is created to be slightly different from the previous one, the teeth move gently and progressively into proper alignment while the wearer goes about their daily life in comfort. For people in pursuit of a beautiful smile, the SmileSesame app offers individuals a simple-to-use first step in this life-changing process. This revolutionary app was recently engineered and refined to deliver optimal functionality, blended with an engaging, easy-to-use experience. The app works by capturing three photographs (or a video) of the individual's teeth. 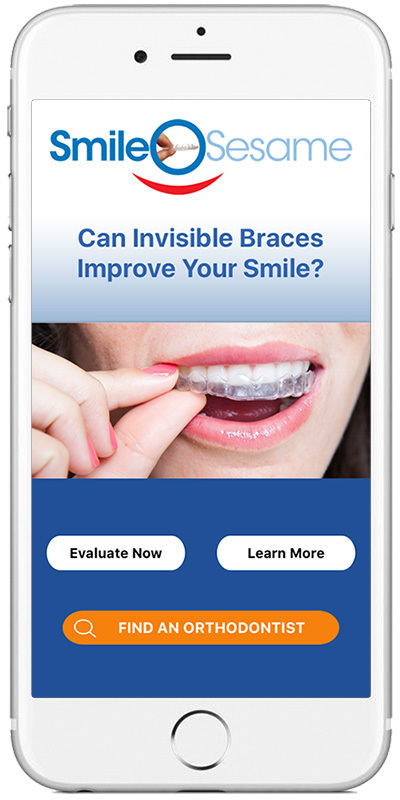 Once the video or pictures are captured, the SmileSesame app sends the images to a board-certified orthodontist who examines and evaluates the images to determine whether the user is a suitable candidate for Invisalign or any other orthodontic treatment. The SmileSesame app is currently available for download—free of charge—in Google Play for Android-powered smartphones. It's also available for iPhone in the iTunes Store.